At the upcoming Goodwood Festival of Speed, Ford will showcase at one-of-a-kind special edition of the Mustang. This version, called the Ford Mustang Eagle Squadron GT, has been built as a homage to American fighter pilots who flew for the Royal Air Force during the Second World War. The Eagle Squadron will be powered by the GT's 5.0-litre V8 but will put out around 700PS. The bike is a joint effort by Ford Performance and drift-tuning firm RTR Vehicles. Changes include a new Ford Performance supercharger, a new carbon fibre body kit and uprated "Tactical Performance" suspension components. 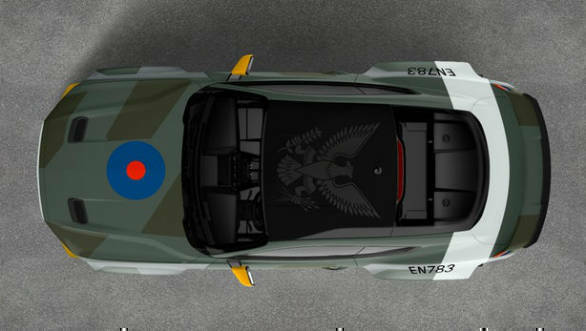 The striking RAF Spitfire inspired paint job completes the enhancements. World champion drifter Vaughn Gittin Jr will drive the car up Goodwood's legendary hill climb course before being put up on display for the rest of the event. After its debut, the car will make its way to a fundraiser by Experimental Aircraft Association in Wisconsin on July 26. The car will be auctioned off here to support the EAA's youth education programmes. The Goodwood Festival of Speed is one of the biggest motoring events in the UK. This is held every year in the grounds of Lord March's Goodwood House. This year's central feature will be dedicated to Porsche's 70th anniversary. Apart from the usual debuts of concepts, new sports cars, classic car auctions, and hill climb runs up the driveway, this year's event will also have special events to commemorate the festival's 25th anniversary.